It is officially cold. Sure we have had cold days this fall already but now the hope of a warm day here or there is slowly slipping away. Don’t get me wrong, I like fall, I get to pull out my comfy hoodies and my boots, (I LOVE my boots), throw my heated blanket on the bed to snuggle in, drink yummy warm drinks, bring it on! What I do not like about it is that it means inevitably the bitter cold and snow of winter is coming, I like snow for a white Christmas and Zach and my annual snowball fight, but after that I am done with it, I hate driving in the snow! 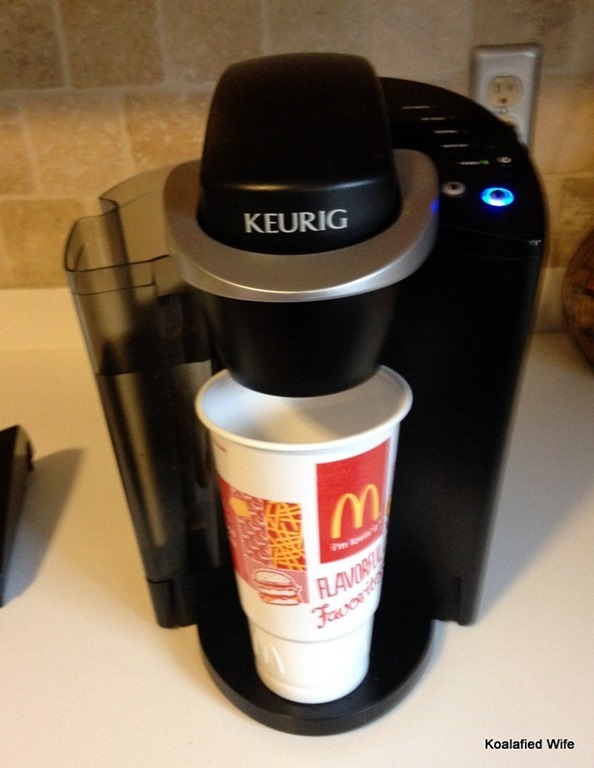 This crisp fall weather makes me crave my favorite warm drinks. Growing up one of my favorite winter drinks was peppermint tea, but I never really branched out to try other flavors. When Zach and I got married his sister generously gave us a Keurig, let me tell you that thing has been so worth it, I use it all the time. Well after we got it, I wanted to try all kinds of yummy warm drinks and found some great deals and started trying all kinds of teas. Which brings me to my before mentioned love of chai lattes, I am still trying lots of different varieties of teas and loving most of them. When Keurig first came out a few years ago Zach’s parents got one and loved it so much they bought one for the family store. Well a few weeks ago Zach mentioned that the Store’s Keurig had stopped working and was only giving tiny cups of coffee, he said they were going to throw it away. When I heard that I said no way, it just needs to be cleaned, so Zach brought it home for me to take a crack at. Last week while we were kitty sitting Zach’s parents’ troublemaker Steeger, I took the “broken” Keurig to their house to clean, Steeger “helped”. 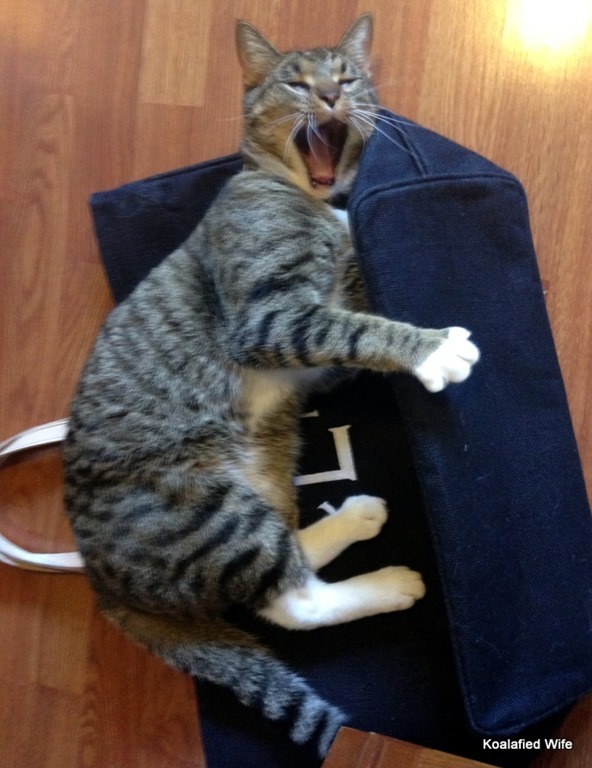 Clearly when I say helped I really mean rolled around on the floor and played with my awesome bag that I carried the Keurig in. Cleaning a Keurig is really very easy, I was actually pretty surprised, it really mostly took time. The supplies you will need are dish soap, water, vinegar and a straightened paperclip. To start things off I filled a sink full with soap and water and soaked the reservoir tank and lid and the drip tray and cover, let me tell you the drip tray needed it. 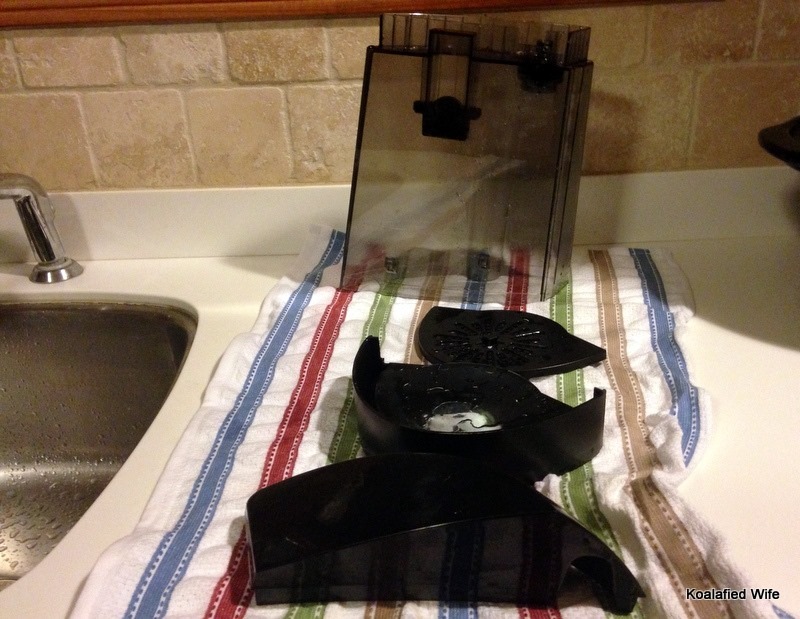 These parts of the Keurig are dishwasher safe however I opted to let them soak instead. I do run our drip tray through the dishwasher every once in awhile to keep it clean so I do know for a fact they are dishwasher safe, however if you keep them clean you wont need to soak them at all. Make sure that you do clean the reservoir tank though, it can get some build up at the bottom. While the pieces were drying I took my straightened paperclip and cleaned all the clogs from the K-Cup holder. I cleaned both needles and the area directly above the cup where the liquid comes out. Once the pieces had dried and I had gotten rid of all the dried on gunk, I put the Keurig back together, it was time to get started with the real cleaning! 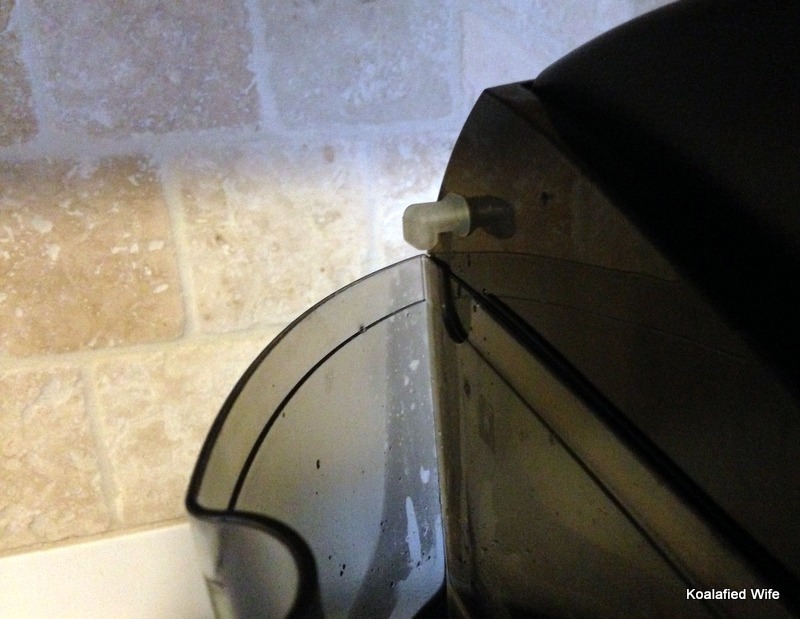 With your reassembled Keurig fill the reservoir tank with white vinegar. I quickly learned after the first cup to put a towel underneath, it was leaking from the bottom because it had gotten so dirty inside. 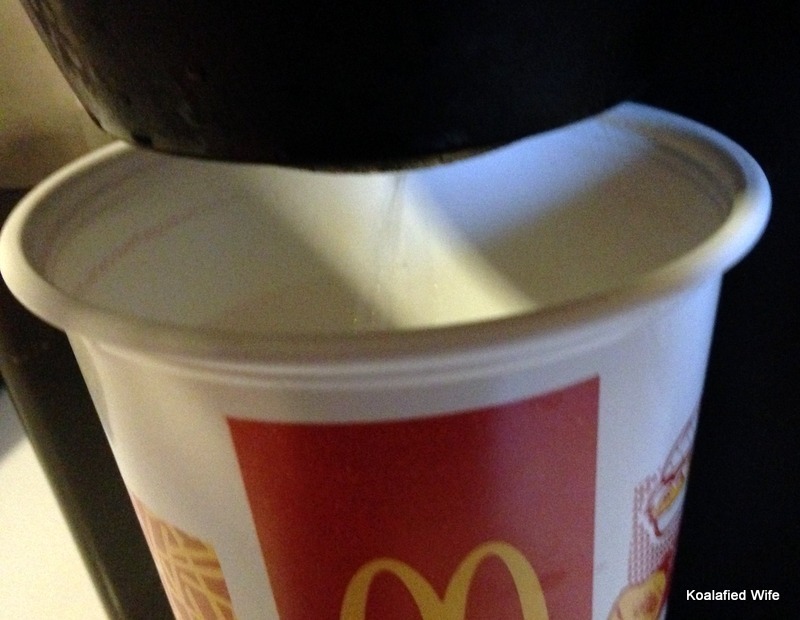 I ran cup after cup of vinegar until the add water light came on, I used a McDonalds cup I could throw away when I was done. The first cup I ran the water was not coming out like I was used to at all, no wonder it was putting out such small cups and the vinegar was gross, it was no longer white and it had dried old coffee in it, it was pretty gross. When I ran the first cup I heard water trickling and it wasn’t the water coming from where it was supposed to, it was trickling back into the reservoir tank. Unfortunately I wasn’t fast enough to snap a picture when the vinegar was pouring out of it but the stream was stronger than what was coming out of where it was supposed to. 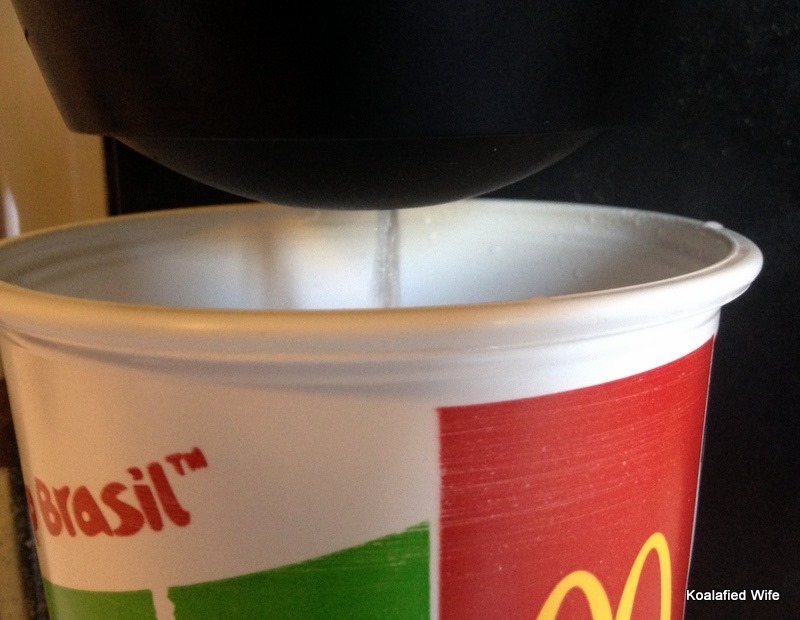 No wonder it was producing such small cups, half the water was refilling the tank. The next part is very important, you must, I repeat MUST let it sit for at least four hours, actually let it sit overnight. Why must I let it sit you ask? While it is sitting the vinegar is inside and working its magic, breaking down what has built up inside causing you to get smaller and smaller cups. 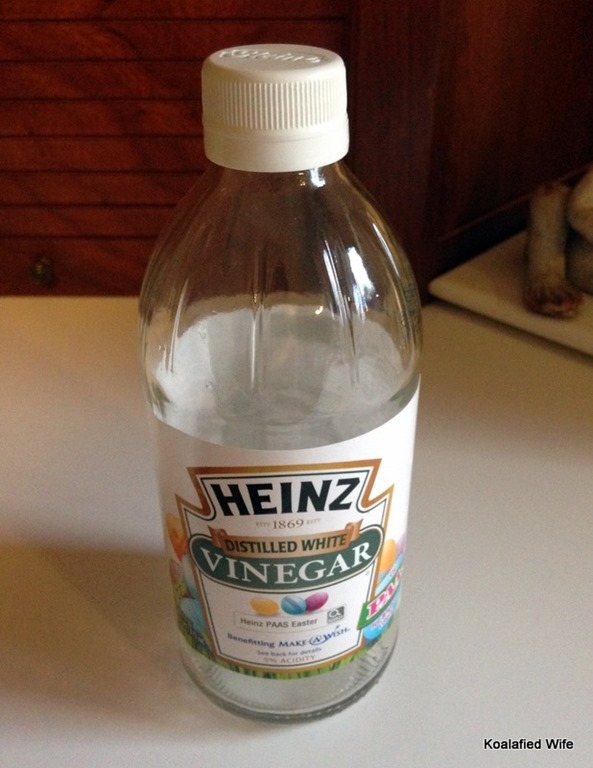 I tell you what that vinegar really can work some magic! After letting the Keurig sit I completely emptied the reservoir tank, washed it again to get rid of all the vinegar, and refilled it with water. 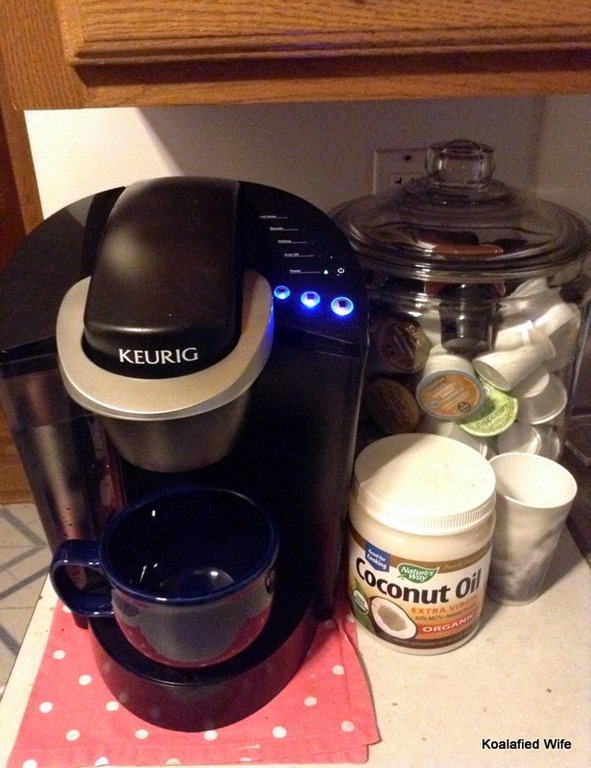 When I ran that first cup I was impressed, it was just like my clean Keurig at home. I actually ran about 5-7 tanks, of water through to flush out the vinegar (I lost count because I just kept refilling the tank and kept running it, I was paranoid that I wasn’t going to get all the vinegar out.) Keurig actually recommends running 2-3 tanks after doing the vinegar but I felt like going overboard, no one would complain if I ran it too many times but they would if I didn’t run it enough. Check out that difference! Well now that we had a freshly cleaned Keurig Zach told me I should take it to work and share it with my coworkers since I had been talking about how nice it would be for the office to have one and how I wished they weren’t so expensive or I would just buy one for us all to share, and the Store had already bought a new one to replace this one since everyone had written it off as broken. 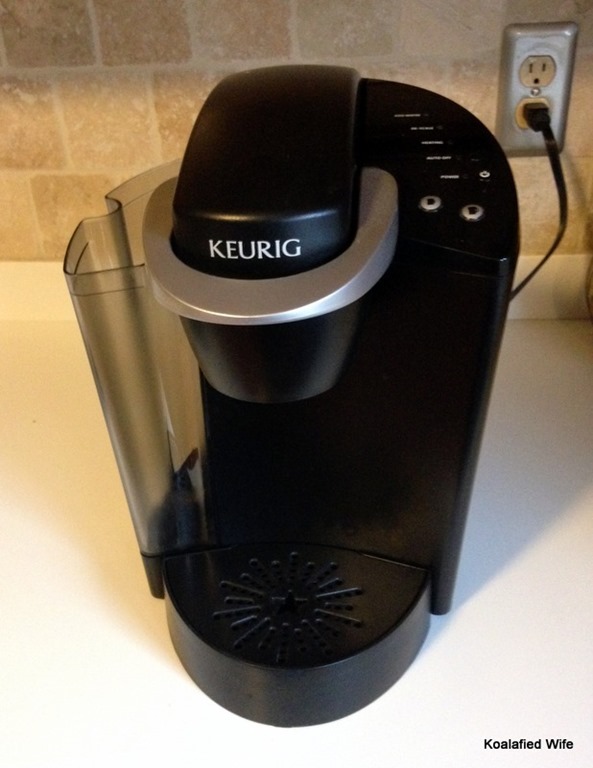 It felt amazing to bring this Keurig back to life, I really felt like I had accomplished something, and I am continuously surprised at what vinegar can do! I am slightly convinced it can fix any cleaning problem. I used up not only all my vinegar, but also all of Mary’s so we both now own a big jug full, after I went shopping, I am a little excited to experiment more with it! On another Keurig related note I was just hearing about how awesome the reusable K-Cups are, since I am not a coffee drinker I had kind of written them off but Mary told me that even for tea they are awesome and tea bags are so much cheaper than K-Cups, so I will definitely be investing in one soon, and so should you, if you haven’t already! Happy Halloween to everyone! 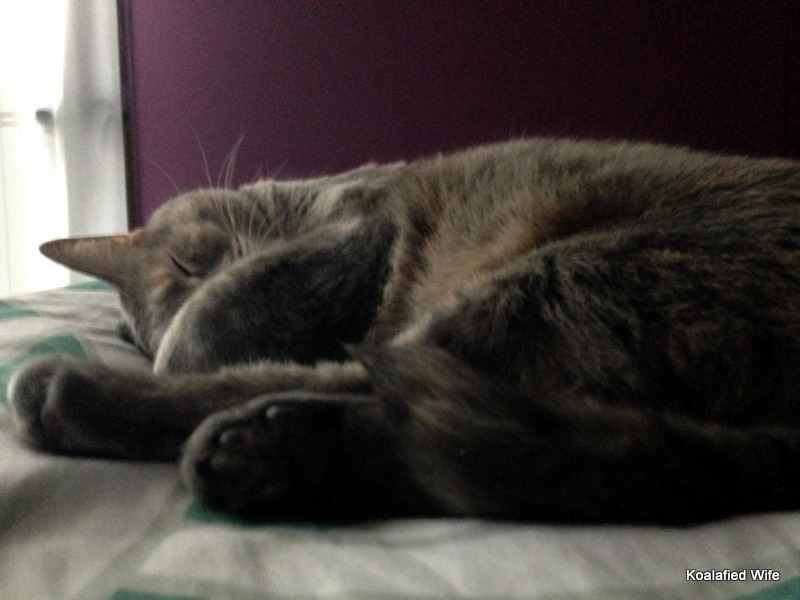 I will leave you with a picture of my favorite little monster, my Toews.